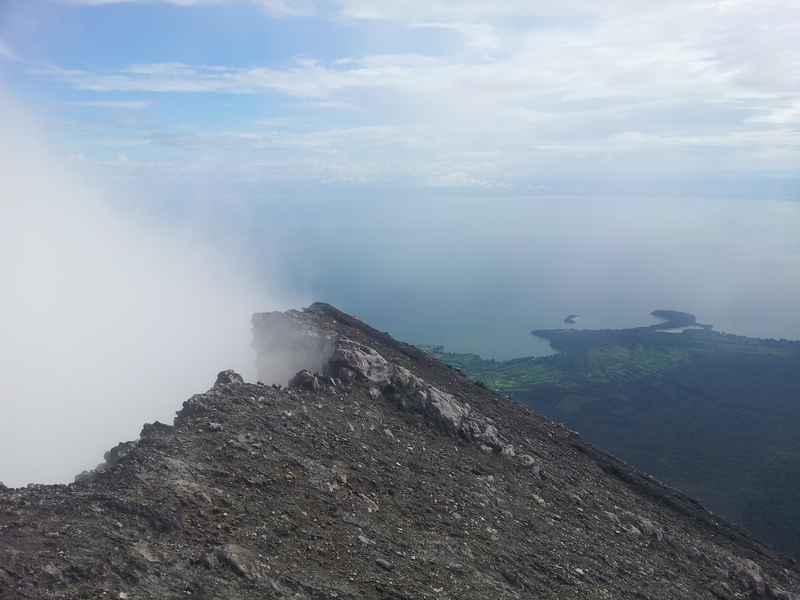 This post covers my experience on Ometepe Island in Lake Nicaragua (mid-November 2013) where I climbed and cycled around Concepción and Maderas volcanoes with Eric (written in Tres Rios, Costa Rica). After León, I stopped off at Miramar beach at Josh´s surf resort (awesome place over looking a world class surf break). It was flat for the 2 days I was there but it was a great place to relax (again! ); thanks Josh! Continuing south on the quieter ´Carretera Vieja a León´ I raced past the capital and arrived in Granada. I cycled the long downhill (nearly an hour) in the dark accompanied by a friendly local on a motorbike from Granada who started chatting to me on the road. I stayed here with Ali and his extremely kind-hearted family. 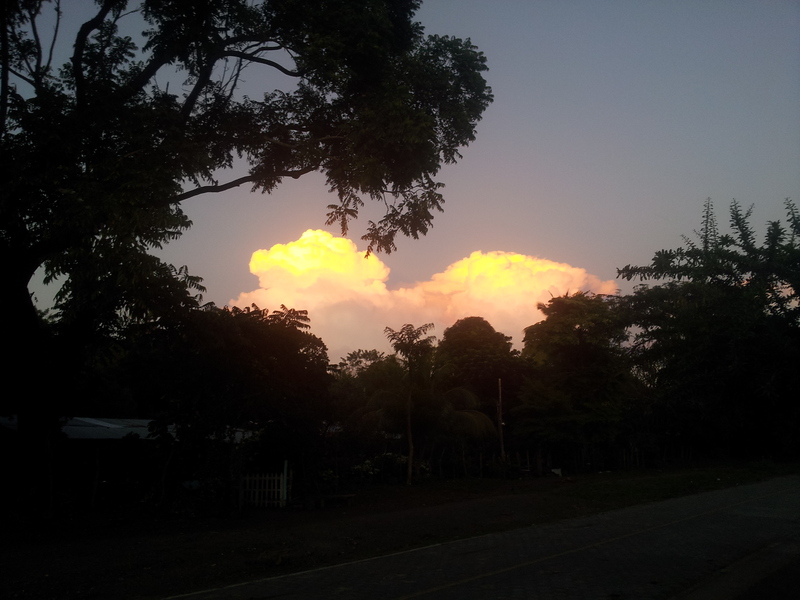 We had met in Chinandega and they were out there exploring ideas for a new place to live. 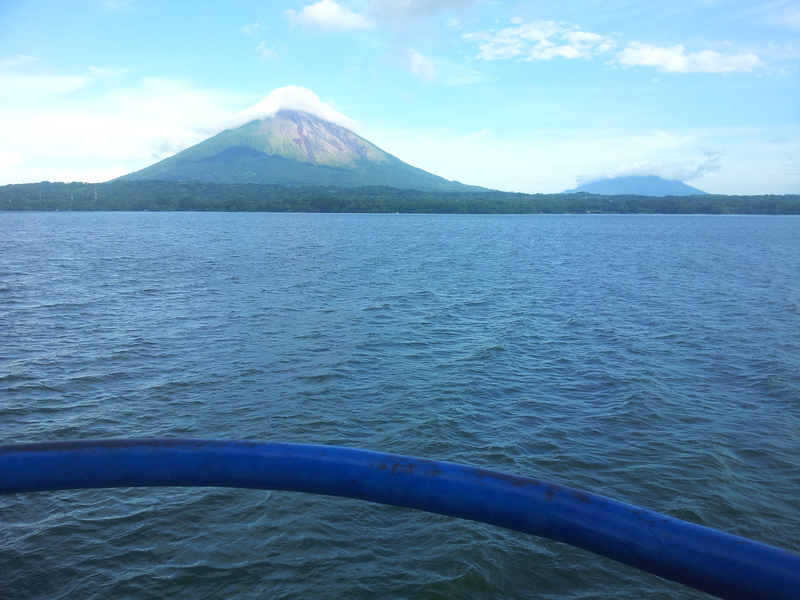 The stretch to Rivas was broken up by a stop in the Poste Rojo treehouse hostel before taking the ferry over to the impressive Ometepe Island that consists of two volcanoes joined together in the middle of the massive Lake Nicaragua. This was where I met alpine touring back country specialist Eric Messerschmidt also travelling by bike. 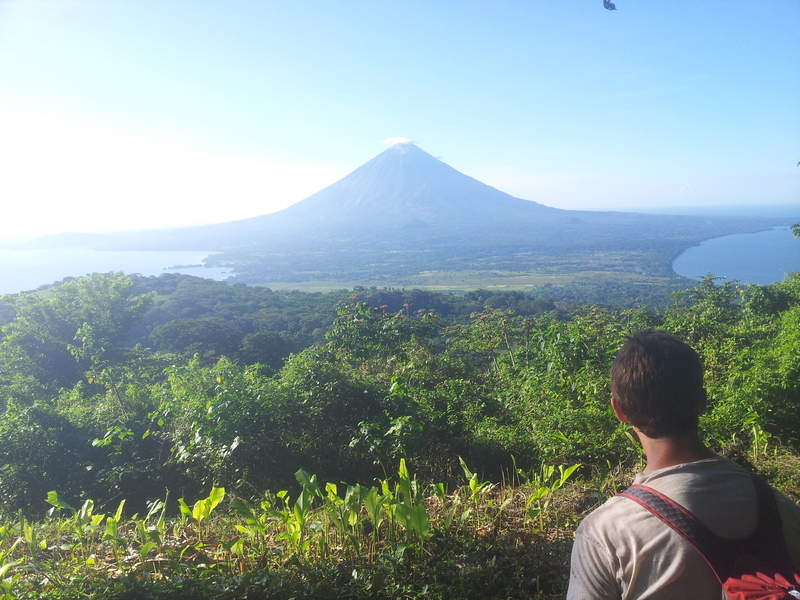 We teamed up for the next week exploring routes that perhaps would have been best left to horses (next post) but we took on Ometepe first. 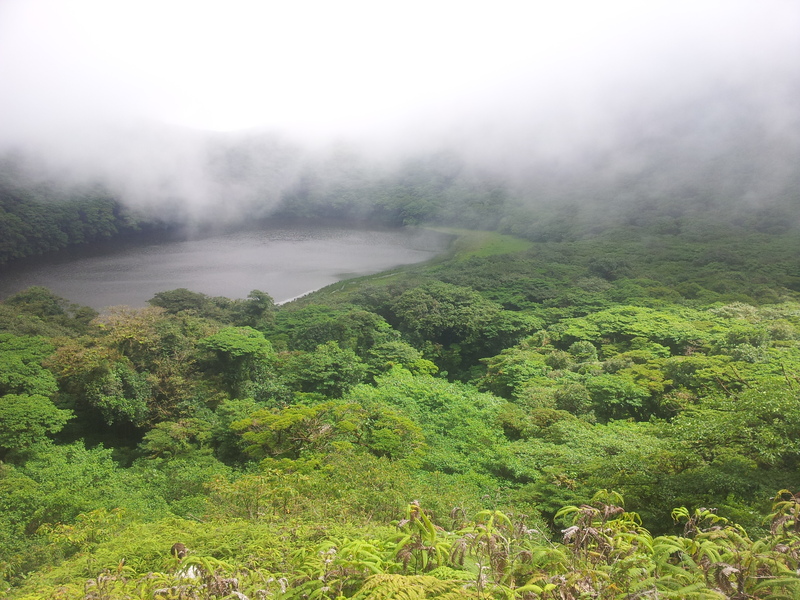 The smaller volcano of Ometepe (Maderas), normally heavily clouded over, offered a rare sight of its stunning lake inside the large overgrown crater. 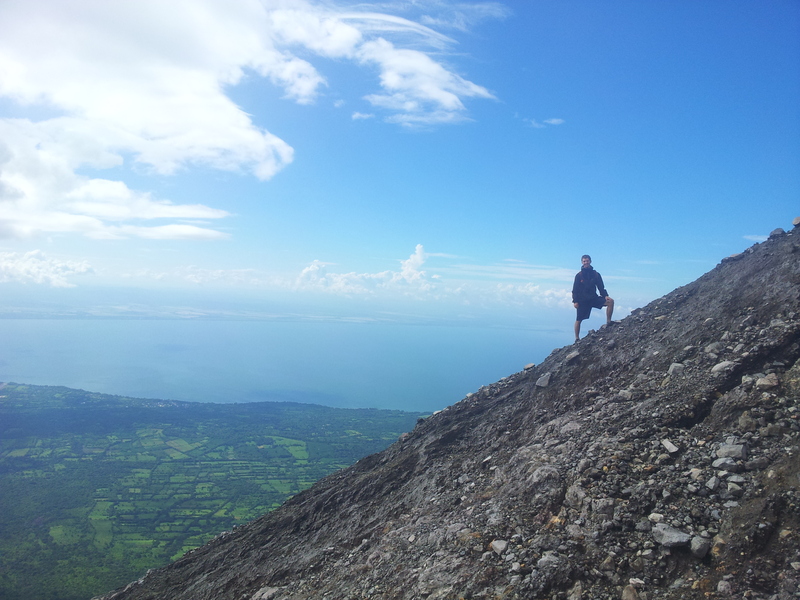 Eric had actually climbed the volcano from Finca Magdalena (worth visiting) a few days before but, since he´s pretty much as machine with limitless energy, he agreed to climb it again from the other side. To get to the lake, we headed up from the Merida hostel (which incidently claims it’s against the law to climb the volcano without a guide and threatens to report you to the police if you do so). There was some navigation through the fields at the bottom and the paths at the top were a tangled tunnel of roots, branches and mud requiring careful footing but with a reasonable amount of hiking experience we felt comfortable without a guide. A large grassy area would provide nice camping on the right side of the lake, assuming it wasn´t raining (which it normally is). We took a quick dip in the shallow lake which had a muddy bottom requiring slightly awkward swimming to avoid being sucked into it. We headed down the other side of Madera to catch this rare view of a cloudless Concepción volcano. After kayaking up Rio Istiam, cycling and hiking to San Ramon waterfalls and cycling round the remainder of Maderas (a fun rough dirt road) we headed up the main prize: Concepción. Starting off from Altagracia, we parked our bikes in a field halfway up the volcano (my bike pump and puncture repair kit were stolen later by a kid that abused our trust but guess he needed it more than me). 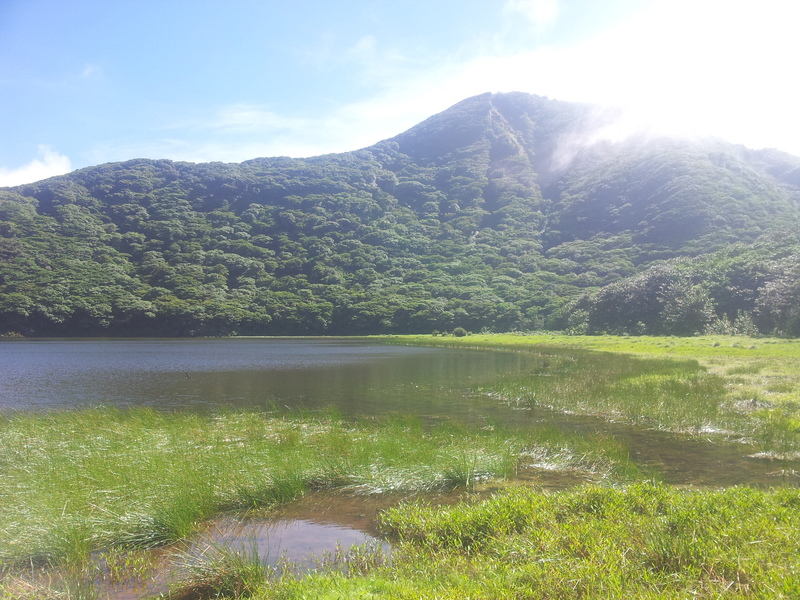 The rest of the hike was very straightforward and felt pretty safe until we reached the crater and started hiking round. But first, since it was drizzling and viewless, we waited on the geothermically heated ground in a small gully to stay warm. Hiking around clockwise, the clouds cleared long enough for us to see this view of Maderas that we´d climbed two days before. 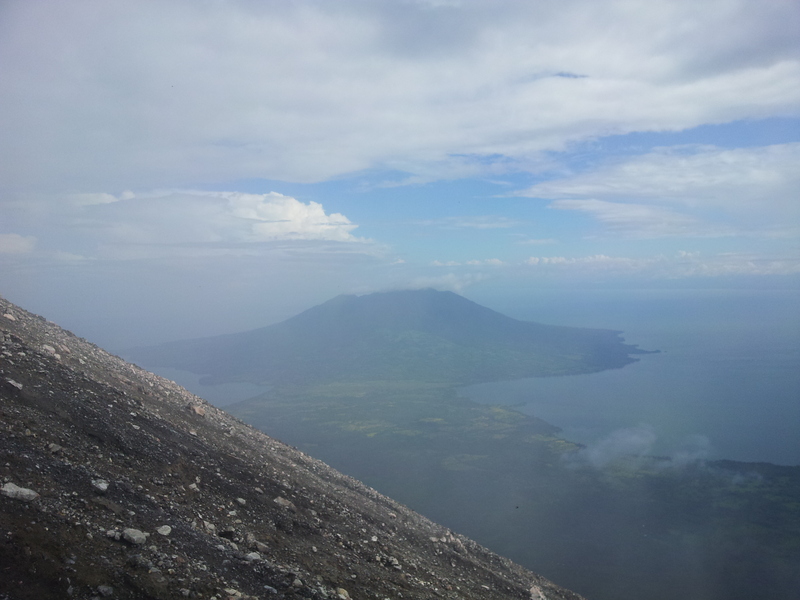 I believe going round clockwise ended up being a lot further but it was hard to see the entire crater due to the vast amounts of smoke pumping out the volcano. It was a treachous experience and not one I´d recommend. 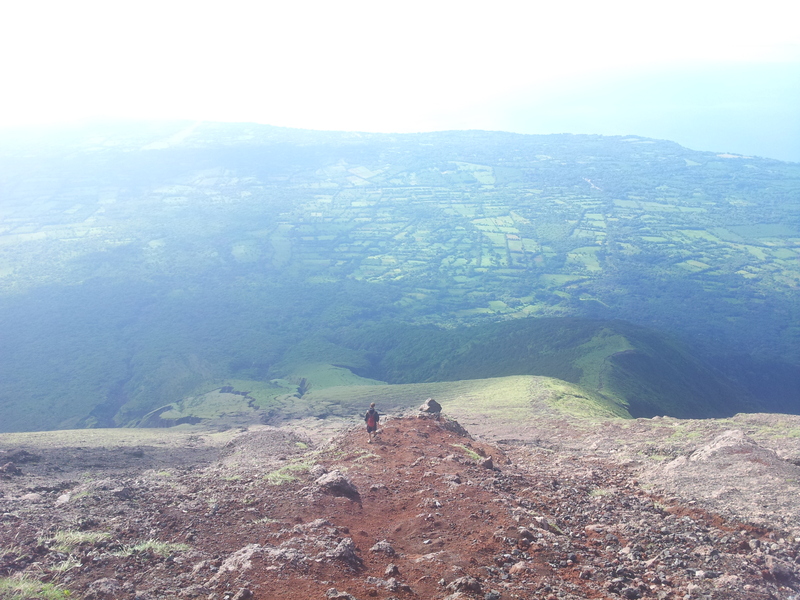 With a cliff and crater on one side and a steep slippery volcanic slope on the other, a slip in either direction weren´t very attractive options. We eventually hit a point where there was a gully in the rim of the crater making it basically impassable requiring some serious technical and dangerous rock climbing. Eric found an alterative route down and round it. An experienced mountaineer, it was great to have him there, especially as my GPS device stopped working when we were trying to find the route down. 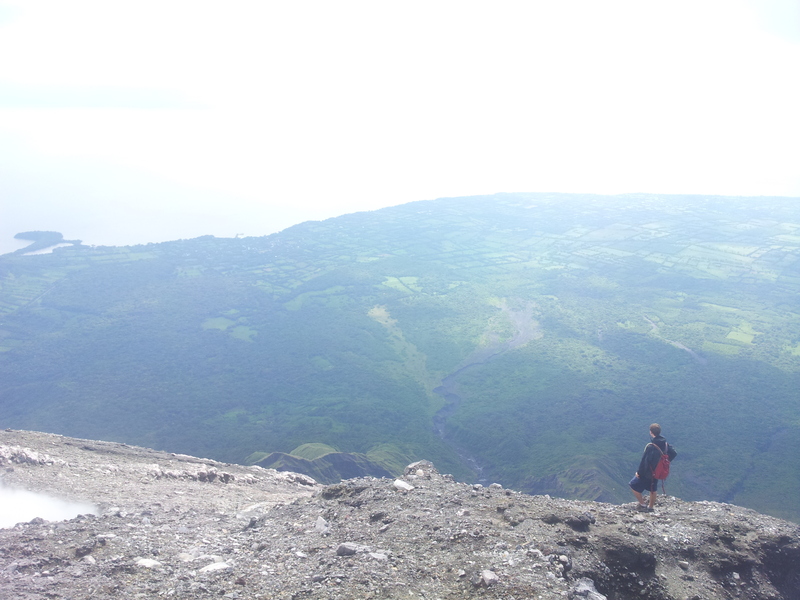 Looking for an alternate route around the crater. The slippery /unstable slope got steeper and steeper and ended in a giant cliff. Heading down the dramatic terrain with enormous gullies and evidence of massive landslides either side. 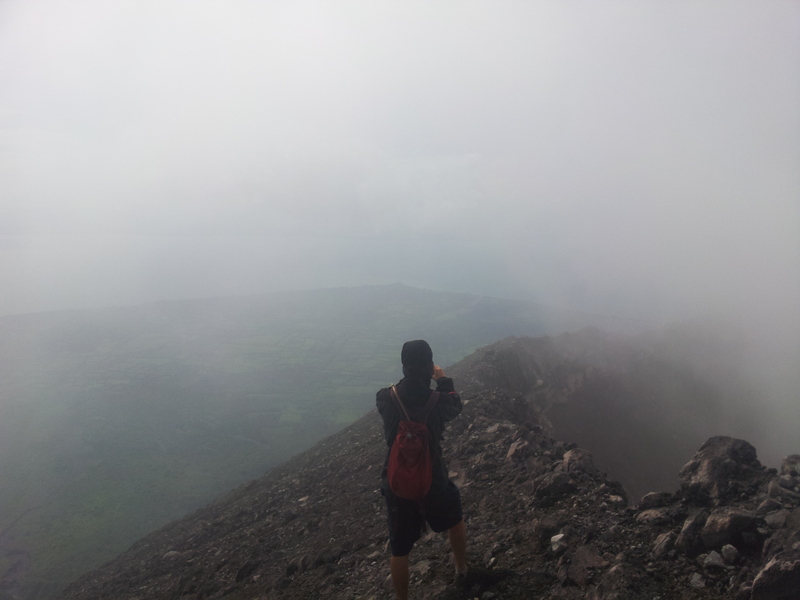 Not obvious from this photo but the clouds were starting to swamp the peak and it felt like we didn´t have much time. We made it down to La Concepción (the same route branches off to La Flor), hiked back to Moyogalpa and caught the bus back to Altagracia in the dark. The plan had to be to take the ‘once every few days’ ferry to San Carlos but it was cancelled (we would have missed it anyway). 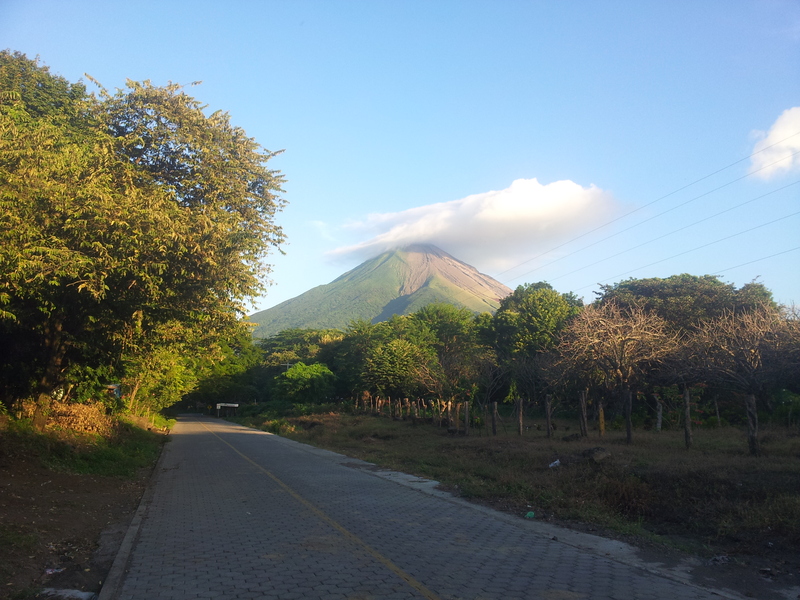 Volcán Concepción, route from: La Concepción, Altagracia. 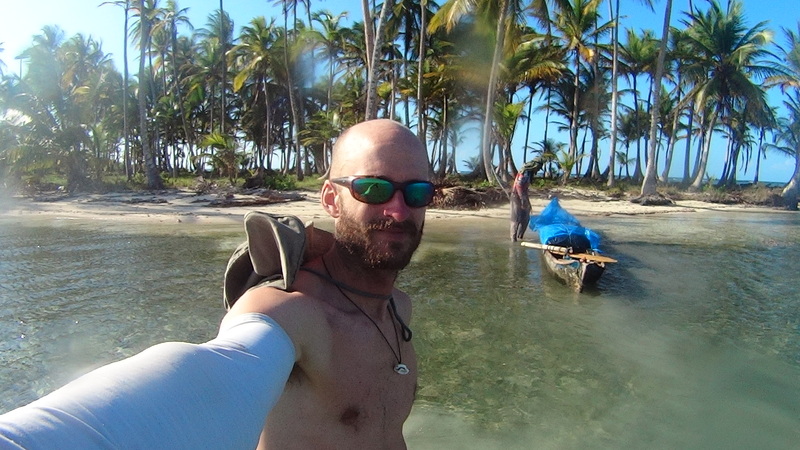 The route from La Concepcion town is far more treachous.